Living in an RV full time is right on par with your normal tiny home living lifestyle. It requires downsizing your life and being as minimal as possible in many areas of your life. Read on to find out what our favorite minimalist devices are that we use in the RV on a regular basis. Move over glass French Press. Living in a tiny space means things get knocked around a lot. 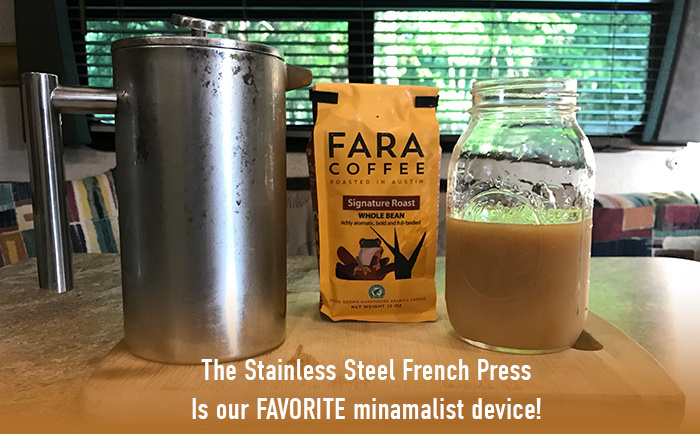 After breaking three glass French presses we finally discovered they make stainless steel models. We are also HUGE fans of cold brew coffee, and we use our 24oz mason jars to brew our coffee. We have broken our fair share of these jars as well though! We have always been advocates for filtering tap water, even when we lived in an apartment. But when living in an RV it’s even more important. While moving around you never know what the water source will be like. Our 10 Stage Filter sits on the counter next to our bathroom sink (it used to be in the kitchen, bur the fixture in our new RV does not work with the filter). We opted for the 10 stage filter for two reasons. One, we already owned it, and two, the Berkey filters are just too bulky and take up a lot of room. This is the smallest most functional printer we could find. Sure, you could find one smaller if you want to manually feed paper one sheet at a time. We feel this printer is the perfect size that also has function. It sits on the vanity in the front bedroom area with plenty of room to use it as a desk. Dirt accumulates like wild fire inside the RV, especially with 3 kids romping around. Our Stick vacuum as well as our WISP broom are essential floor cleaning tools. We often times even use the vacuum on our bed after our children have mischievously eaten food in it without asking. The nice thing about these tools is the fit easily into the small RV closets. Simple and cheap. This little hooks are great for many things: hanging the welcome sign outside our RV, hanging measuring spoons inside our cabinet, putting up Christmas decorations during the holiday season, hanging hats, bags, etc. The list goes on. They help get things up off the floor and out of the way. Kristy also used them for organizing jewelry on the inside of her closet door. We use the command strips to hang the WISPsystem Broom inside a closet door. This small LED disc lights are great for the inside of our cabinets that don’t get much ambient light from the RV. They are cheap, easily to install, and take rechargeable AAA batteries. I even discovered some on Amazon with remote on-off switches! We have found that our air conditioner/furnace thermostat is very inaccurate. So, this helps us accurately set our indoor temperature. The humidity gauge is also nice as well because it helps us know how proactive we need to be about controlling the humidity levels. This are just a few of our favorite things. I’m sure there are probably a dozen other awesome gadgets we don’t even know about, but these are the ones we feel make our life more simple and enjoyable in our tiny home on wheels. What are some of your favorite tiny living gadgets. Let us know in the comments.